For most working moms like me, a quick stir fried dish is probably a menu regular. At our house, a stirfry of vegetables and some kind of protein is certainly a dependable standby. When I am burnt out on ideas of what to cook for dinner the usual beef with broccoli or chicken with broccoli stirfry usually comes to mind. All the ingredients are staples so more than likely I will have the ingredients handy. The bad thing with standby dishes though is that soon everyone gets tired of them and you get that whine of “AGAIN?” in unison every time you announce what’s for dinner. So just to give the same ol’ same ol’ a bit of a twist, present it a little differently and change up the flavor just a bit. So for this variation, I kind of crossed the usual Beef with Broccoli stirfry with the ‘Filipino Bistek‘. The beef has a lemony, salty flavor that is strong enough to balance the simply steamed broccoli florets. If you’ve thought ahead, you can marinade the beef ahead of time which will further shortened your prep time and infuse the flavors in the meat. But if you’re like me and don’t have much time, I found that if you cook the marinade into a sauce for the beef, you kind of compensate for the short marinade time. 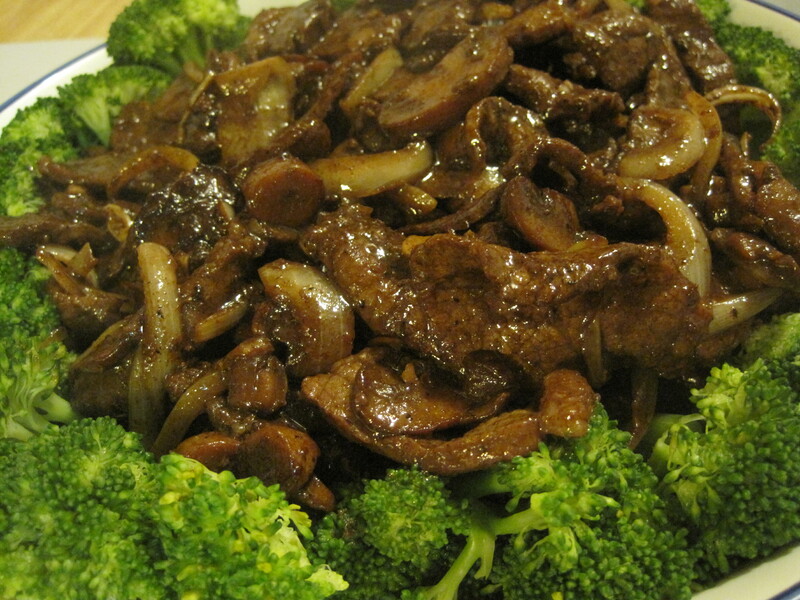 Stirfried Beef flavored with lemon and soy based marinade, Mushrooms and steamed broccoli florets. Mix the beef with the marinade ingredients (soy sauce, lemon juice, red pepper flakes and sesame oil) and set aside while you prepare the rest of the ingredients. Steam the broccoli for 5 minutes, drain and place in serving bowl. Heat a skillet or wok and add the butter until it is melted and bubbly. Add the mushrooms and cook until the liquid has evaporated and the mushrooms are starting to brown. Add the onions to the mushrooms and stir fry for a couple of minutes. Set aside while the beef cooks. Drain the marinade from the beef but don't throw the marinade away. Heat a tablespoon of oil until smoking and add a third of the beef to quickly sear. You'll cook the beef in two to three batches so that it will sear in the hot oil rather than steam and generate more liquid. Add the seared beef to the mushrooms and onions you've set aside and finish searing the rest of the beef. After all the beef has been cooked, add the marinade into the skillet/wok and bring to a boil. Reduce by half, for a minute or so. Add the beef, mushrooms and onions back into the pan and stir. Add two tablespoons of Oyster Sauce and stir through to mix. 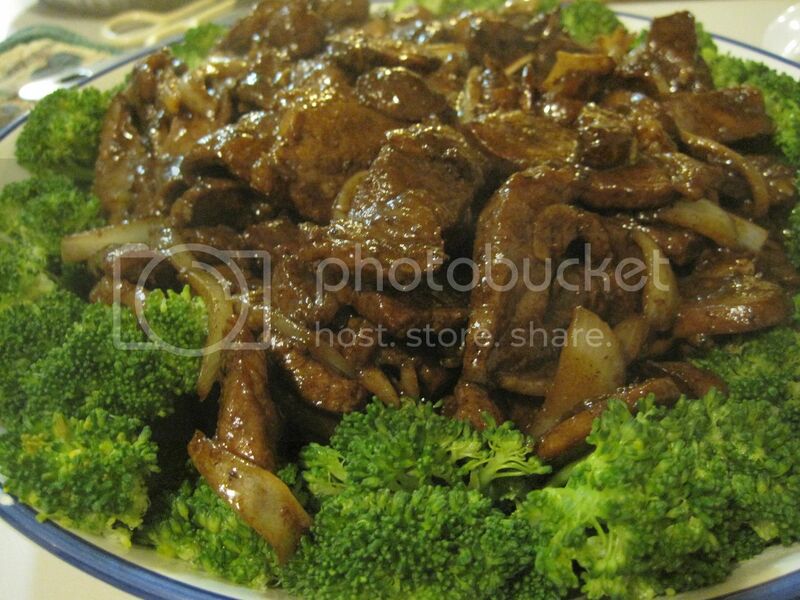 Spoon the beef/mushroom stirfry over the broccoli and serve. The amount of beef and broccoli was intentionally left vague as this depends on how many people you're feeding and how much you want to prepare. I usually use at least two pounds of beef and a big bundle of broccoli (about 4 heads) Also, depending on your taste and how salty you like your dishes, you may opt to cut down on the amount of oyster sauce. My family tends to like dishes well salted.